I continue to enjoy my new EAA membership, and am super impressed with our KEUG Chapter 1457 because the monthly meetings are not just a bunch of hangar flyers, but instead a means to learn something new. Yes, it is true I cannot attend one of these meetings without the subject of rivets coming up. At the April meeting's informal pre-meeting dinner, the “riveting” discussion was about something called “clecos” which I learned are an intimate friend of anyone building an experimental airplane. OX-5 engine on display at the LCC teaching hangar. I also met Steve Kretsinger, an FAA Air Traffic Controller and Chapter 1457 member who owns the very first Taylor J-2 Cub to be built after Taylor moved into the factory in Lock Haven, PA that would become the iconic Piper Aircraft Company factory. Kretsinger's 40 HP Cub has no brakes, barely any modern instrumentation, and can land, stop and takeoff in 500 feet. He told of a trip in the J-2 from Eugene to the Reno Air Races. With a 200ish NM range, the trip was one fuel stop after another. Because of a number of gusty mountain ranges along the route, the light little taildragger was a handful on this exciting journey. This was the kind of hangar flying tale one expects to hear at a really great EAA chapter meeting. 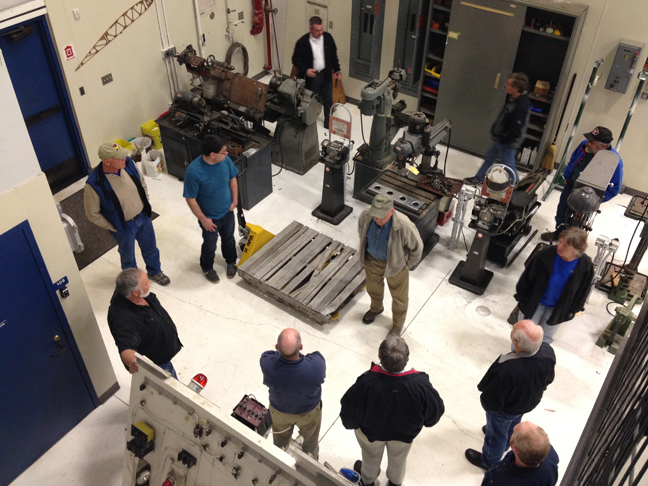 But the best part of this month's meeting was a tour of the Lane Community College Aviation Maintenance Technician program's teaching facility. 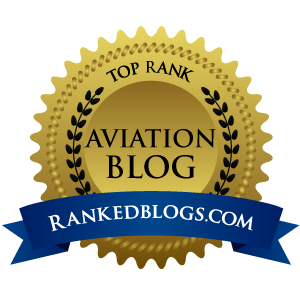 Hosted by LCC instructor Keith Bird, this was a productive few hours as I learned plenty about what it takes to earn an Airframe and Powerplant License. Students in the program learn “hands on” at LCC because it is also an FAA-licensed Repair Station. Work on customer airplanes is done by students supervised by instructors and can be a good deal if a quick turnaround is not required. The school does not charge for labor and an average annual on a Cessna 172 is about $600...but takes about three months. 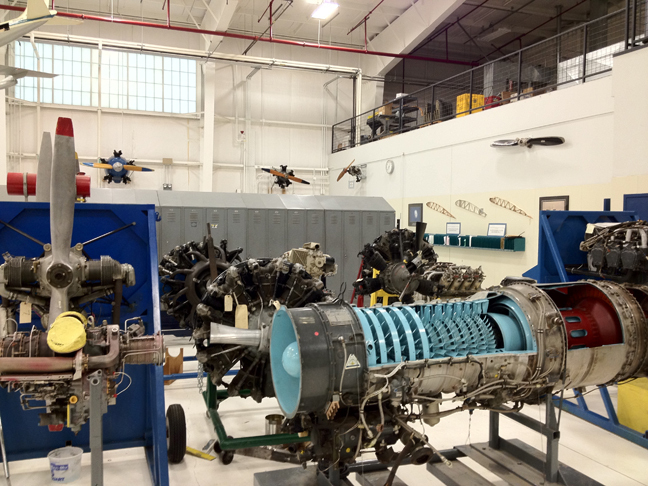 As they learn, students are exposed to all segments of airframe repair and maintenance, plus both reciprocating and gas turbine engines. It is this well-rounded education that keeps Bird's email buzzing with companies looking for technicians. 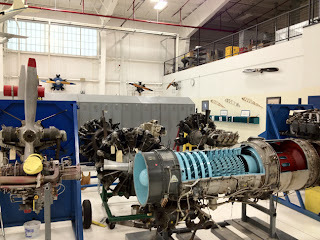 Classes are held in a modern facility with wall-to-wall equipment of all types, including computer stations, engine analysis, magnafluxing, and every sort of machine needed to return an airplane to service. Bird's RTS class is the real deal. It's where classroom and lab work meets reality, and students are transformed into new technicians about to start working in the trade. Each day in this intense class, Bird gives the students practice FAA test questions. He seems relentless on this aspect of training at LCC...passing the FAA test is not taken lightly, because after 1,900 hours in the program and about $9,500 per student for tuition, fees and books, getting past the written is not an option if a job is to be had on the other side of graduation day. 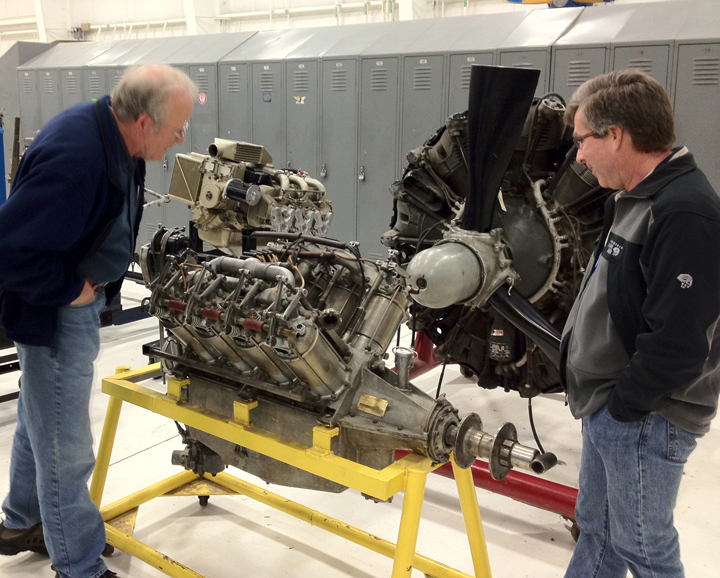 The LCC program – or any A & P Technician program for that matter – is a great place for both certified and experimental airplane owners to learn more about their flying machine, Bird said. 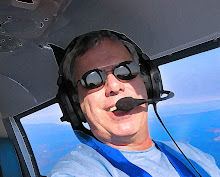 He encourages any pilot to take the course, and also would like to try and start an airplane owner/operator night class to teach airplane owners what they can do legally to their airplane, how to perform these allowable repairs, and how to properly sign off on everything in their logbooks. Another possible night class Bird would like to see develop at LCC is a program to teach experimental airplane builders to use the specialized equipment and tools at the facility. Neither of these night classes are coming soon, but both are programs Bird would like to see evolve into future curriculum. He would also like to form a partnership with the local EAA chapter as a way to work with and teach chapter members to rebuild engines and airplanes to re-sell as a way to fund the program. I was blown away by the vast amount of teaching opportunities available in the LCC Aviation Maintenance Technician Program. I have always said that if someone that is good with tools was young, eager, dependable, willing to travel and liked airplanes, a great job and bright future was available as an aircraft maintenance technician. After touring the LCC facility, I know this to be true.